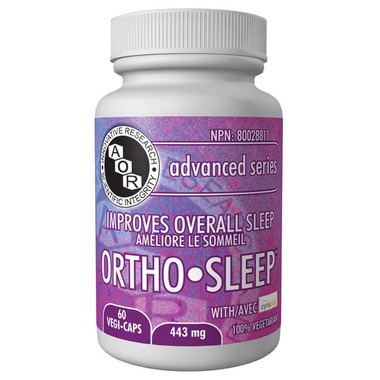 AOR Ortho-Sleep was formulated to be the most comprehensively powerful natural sleep-aid available to improve overall sleep. Ortho·Sleep™ is clinically proven to help increase the total sleep time (aspect of sleep quality) in people suffering from sleep restriction or altered sleep schedule such as shift-work and jet lag, and helps relieve the daytime fatigue associated with jet lag. Ortho·Sleep™ is also clinically proven to help reduce the time it takes to fall asleep (sleep onset latency aspect of sleep quality) in people with delayed sleep phase syndrome, and helps to re-set the body’s sleep-wake cycle (an aspect of the circadian rhythm). Adult Dosage: Take 1-2 capsules before bedtime or as directed by a qualified health care practitioner. Non-medicinal ingredients: microcrystalline cellulose, maltodextrin, gum Arabic, silicon dioxide. Capsule: hypromellose. †CYRACOSTM is a registered trademark of Naturex. AOR Guarantees: that no ingredients not listed on the label have been added to the product. Contains no wheat, gluten, nuts, soy, eggs, dairy, fish, shellfish, or any animal byproduct. I really like this product! It really helps you to fall asleep fast and have a restful sleep. I never woke up drowsy or tired; this product allowed me to sleep through the night! The only thing I didn't like was the strong taste of the capsule, but it goes away fast, so no big problem. I really like this product. It helps you to fall asleep fast and have a restful sleep. I never woke up drowsy or tired; this product allowed me to sleep through the night! The only thing I didn't like was the strong taste of the capsule, but it goes away fast, so no big problem. I am a shift worker and this product is a life saver! When I need to switch from days to nights or vice versa, these put me on track...and with no ill side effects either like feeling groggy. I'm so glad I found these. They make my transitions so much easier. Best sleep aid available that doesn't require a prescription. I live in a noisy environment that wakes me up every hour. This helps me get back to sleep almost instantly or even sleep through noise that would've woke me up previously. I really like this as a sleeping aid. It takes about 30-45 mins to really kick in, but you can feel the shift of the pill working as your eyelids get heavy and you start to fall asleep quickly. Melatonin alone doesn't do anything for me, and this pill does. The best sleep and relaxation aid we have found. Very effective natural formula for sleep . No sensation of droopiness in am. Safe to use long term. This product is helping me to get away from a prescription drug that I really don't like to use. It is helping. Once I found this, I have never switched. This was recommended by an Integrative Medical doctor as a good source for Melatonin. I have never looked back. I take 2 every night. It does have a bit of a smell, not unpleasant. Is one of the most effective sleep aids I have tried. I sleep more soundly without the hangover effect when I wake up in the morning. It helps keep me asleep- I get about 90 minutes without it, but if I take two before bed, I can get 5 ore more hours. Unfortunately this did not work for me at all. I was very hopeful after reading all the reviews, and so I was quite surprised and disappointed when it actually had the reverse effect on me. Did not help me sleep at all. My Naturopath doctor recommended this for me. I take 2 capsules, and within 20-30 minutes I'm asleep! Most important, I don't usually wake up again until the alarm goes off, and I don't feel messed up the next day. It will be a great product when I travel, adjusting to time differences and new surroundings. I gave this 4 stars because it is expensive... that's the only negative. It's a must have for me when I travel. It is a guarantee sleep when I take 2. It helps me relax and I don't wake up groggy. I don't take this often, but I take one when I'm stressed and haven't been able to sleep well. It helps me relax and drift of fun I sleepy quickly. I wake up at my normal time, feeling totally refreshed. I really like that this has all the main natural sleep aids sort of packed into one capsule. It's not a miracle worker....nothing is for my awful sleep issues, but it does help and for my insomnia, that says a lot. I liked this formula because the amounts of the individual ingredients were well documented as effective dosages. It is working well for me to correct long standing sleep issues along with some lifestyle modifications. This seems to be a good mixture. I have a bad reaction to melatonin so I was worried about its inclusion, but I have slept better since taking these pils....and far cheaper than trying to buy each ingredient separately as I was doing. These have helped me SO much! When I discovered I had fibromyalgia, I was having terrible brain fog and was both insomniac and chronically fatigued. OrthoSleep has been the biggest part in getting me functioning again! I use it every night. Excellent product. Good night sleep and wake up with a clear head! Been a few months taking these now, I take 2 a night and they really work wonders for me! No side effects at all. So far this product is really helping me sleep through the night, I'm only taking 1. Some nights it does give me crazy dreams but just happy to be sleeping through the night. My husband took this a few years ago and it worked great for him as well.